Amazing displays. Easy to use. Great rates. Digital Advertising Trailers are perfect for taking your message direct to your audience. Add an extra dimension to your next event and take advantage of the most cost-effective, high impact, out-of-home advertising media. No hidden fees in our fantastic value hire deals. Drop off, pick up and training included. Make an impact at your next event or exhibition and hire one of our stunning Geo Walls. Popular sizes include 3m x 2m and 6m x 2m. Eden Bridal recently won 'Best Stand' at the prestigious Wedding Journal Show after hiring a 5m x 2m Geo Wall, 1m x 2m Geo Plinth and a 50" touchscreen display. All three displays showing dynamic content that captured and held attention. Colliers International wanted something different for the launch event of their stunning offices in Belfast. 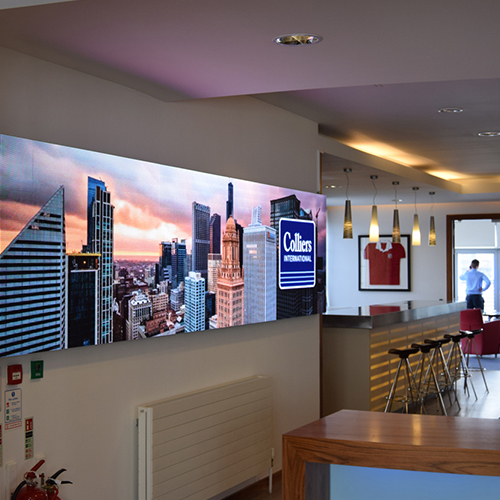 We were commissioned to create this head turning 5m x 1m narrow pixel pitch display to perfectly compliment the building's sleek contemporary design. An incredible 84% of UK retailers believe digital signage helps create significant brand awareness.Will it be your brand or someone else's that people see? 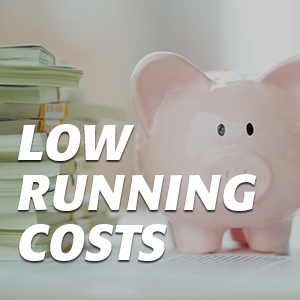 LED technology is extremely cost effective when it comes to running costs. Say goodbye to print production costs and expensive ineffective mail drops. A study has shown that digital media in public venues reaches more customers than videos on the Internet or Facebook! In addition, digital signs are better remembered than advertising shown through other digital sources. Are you sitting on the fence about going digital? Let us help make your mind up. Call us today for our latest rental offers and take your next event to the next level. We're always happy to how off our products - arrange your free demo today! We can provide full on-site support if required but our software is really user-friendly and we're sure you'll love using it. Full training is provided on delivery and we're always at the end of the phone for any questions you might have. Utilising digital displays at exhibitions and tradeshows can help increase event attendance 20%, increase productivity 27%, and decrease costs 20-30%. That’s a lot of evidence that digital signage at your next event is worth the investment.